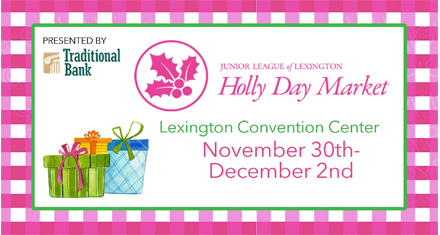 Mark your calendars for the 12th annual Lexington Junior League Holly Day Market Presented by Traditional Bank. The Holly Day Market brings together vendors from across the country to Lexington for one weekend to give shoppers the opportunity to buy holiday gifts in one spectacular location: the Lexington Center. Daily events including cookies and pictures with Santa, door hanger workshop, Friday happy hour, and a wreath auction, are sure to make the market fun and memorable for all! Click here for ticket information and to learn more. JOIN HOLLY on FACEBOOK and INSTAGRAM- Holly Day Market-Junior League of Lexington. Please contact Joy Dineen, Holly Day Market Chair, with any questions.